Jay: Welcome, everybody. It’s Jay Baer at Convince & Convert, joined today by a very special guest, my good friend Mark W. Schaefer. Mr. Schaefer, how are you, good sir? Mark: I could not be better. Jay: What does that W stand for anyway? Jay: Which brings us to today’s book, Return On Influence . Usually when I wave the book in front of the camera in these interviews, I have the book, but because I was graced with the electronic version of the book, I think I owe you $25, and I only have printed out the cover so that you can see what it looks like. Mark: The hard copy book is coming to you. I’m going to be signing some copies next week. Of course, you’re featured in the book so I owe a great debt to you for your help. Jay: Well, I think it’s quite the contrary, but thank you very much. It is a terrific book. Jay: I devoured it. I devoured it recently on an airplane as I typically do. It was really, really good and obviously a tricky subject. There was a reason why nobody in social media has written a book about the nature of influence. Tell us why you decided to tackle this tricky subject? Mark: I’m thinking, wow, people don’t react this way over pagerank. This is something new. And then Jay, I started hearing about all these companies that were actually using it. Disney, Audi, Revlon; these are not schlock companies, so I got really interested in it. I thought that this could be a mainstream trend. Of course, now everybody knows about Klout and talks about Klout, but a year and a half ago it was unknown. And really, it’s actually still obscure to most people other than people like you and me. I made a proposal to my publisher, McGraw-Hill, and this was the tricky part. I turned in an outline and I said I don’t know what this book is going to be about. Jay: That’s always what they want to see in the proposal process. Mark: That got their stamp of approval right then and there, baby. And I said, because there is no story, there are no experts. This is completely new. It’s developing week by week. I can give you an outline of what I think it’s going to be, but I’m going to let the research tell the story. I turned to experts like you and to Robert Scoble, and the famous acclaimed author, Robert Cialdini, the author of “Influence at Work .” I did about 70 different interviews and I also did academic research to figure out how did we get here? What the science behind these formulas? We don’t know their secret sauce and we never will, nor should we. It’s their secret sauce. There’s enough academic research out there that you can piece it together and have a pretty good idea of what they’re doing. That’s what I did, and at the end of the day I tried to present a balanced book where I really give Klout and the other companies that are now flocking into this space a lot of credit for trying to do what they’re trying to do, but I also say there are problems. There are problems with gaming the system. There are a lot of issues, as you know, with privacy. I addressed some of those issues head-on, but at the end of the day, I do think they’re onto something. I think that there is something legitimate here. I think that there is solid science developing here and that this is a trend we need to pay attention to. Jay: The book is called “Return on Influence”. The question people always have about Klout and similar services is how can you possibly deign to measure something as amorphous as influence? 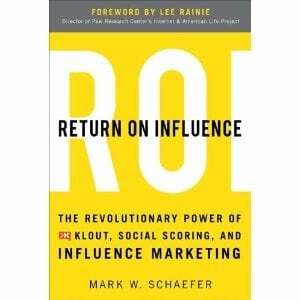 How would you, Mark W. Schaefer, define online influence? What is the marker of online influence? Jay: Well, you wrote a book about it. It shouldn’t be that difficult. Mark: It’s difficult to say in a sound bite. The first half of the book basically explores that question. It explores that difference. This was the interesting thing Jay, because not a lot has really been written about this. Volumes have been written about how to be influential and win friends and influence people, and how to be a better car salesman, and how to be a better this and how to be a better that, in the carbon-based world. But there hasn’t really been a lot written, and I was really amazed, Jay, at the lack of even research that’s been done as far as this idea of influence online. Jay: One of the things that I think people struggle with, with regard to Klout and online influence, is this notion of reciprocity. We talked about that a little bit for the book. We have very much in our social media bubble this culture of “I’ll scratch your back and you scratch mine.” Klout, by their own admission, says if you interact with people with higher Klout scores it will raise your own Klout score. That’s part of the algorithm. They’ve acknowledged that over time. As we talked about in our interview, though, if people are doing things because it’s intrinsically beneficial to themselves, are you really influencing somebody when all they’re really trying to do is benefit themselves ultimately? Mark: That’s so interesting. It’s such a interesting question. I really enjoyed exploring that part of the book, because what makes it so fascinating is that what I’ve found out through the academic part of the research was that humans have this insanely deep innate process to return a favor. We almost can’t stand it. When someone does something nice for us we just have to pay it back. We’re almost driven to pay it back. In the offline world, in the human world, usually that means whenever you do a favor for someone you’ve got your skin in the game. Someone’s knocking at your door at midnight saying, “My baby is sick. Can you take me to the hospital?” Certainly, a gift, a favor, something that happens at work, a promotion, you don’t forget those things. Mark: In their mind this is legitimate. It’s just like doing some big favor for you in real life. So there is this disconnect, and that is a big difference between influence in the online world and the offline world. Jay: One of the premises of online influence and Klout and things of that nature is your ability to move larger than average numbers of people to act in some way. Yet, as our friend Jason Falls talked about in the book and I thought was really interesting, in many cases success on the social web isn’t so much about breadth in broadcasting, but about narrow casting. As he says, he only needs a few clients at a time. He only needs a few people to read his blog, a few people to sign up for his monthly advice service for this to be successful. To some degree we’re being encouraged to build these big networks, but maybe we really just need a smaller network that really and truly cares about what we do. Mark: I thought that was a really interesting contrast. In the book I used the example of my friend who really built a career because he was so likable and it got to a point where he kept getting promoted, and it got to the point we were saying, “Is this guy really smart or is he just so likable?” In that situation he has zero room for error. If you build your career on likability in the offline world, you can’t have any enemies. You’ve got to really drive that. As Jason said, the numbers are so big in the online world you can afford to not necessarily be liked by everyone. I think he said, “I just have to be liked by six marketing directors in the world. That basically will make my career very nice.” That’s another very fascinating difference to explore. Jay: Although if you look at it, I feel like there are people in our world who are inherently more likable or believed to be so, or that’s the public persona they project. It certainly helps if they have the chops to back it up. Look at somebody like Gini Dietrich, who is by all accounts highly likable and everybody wants to be around her, but she also knows what she’s doing, which doesn’t hurt. The combination of the two is really powerful. Brogan is the same way. Very likable guy, much more so than most people would expect. Falls is the same way. It’s interesting. When you get it coming from both directions, I think it’s a one plus one equals three circumstance. Mark: Absolutely. I think in many ways the social web really amplifies personality. If you’re a jerk people are going to sniff you out. You’re not going to be able to fake it very long. Mark: Some of the people that you mentioned, I haven’t met Gini yet. I’m going to meet her at Social Slam. Jay: Is she coming to Social Slam, too? Social Slam, April 27th, Knoxville, Tennessee, run by the man, Mark W. Schaefer. It’s going to be incredible. Mark: What an amazing lineup. Gini is a keynote speaker, Mitch Joel, Tom Webster. Jay is going to be there, Marcus Sheridan, Stanford Smith from Pushing Social. This is amazing firepower in one room for an $89 ticket. It’s an amazing day. Does Klout Score Mean You Know What You’re Doing? I think Klout feeds into that mentality a little bit. People would say, “Well, I have a Klout score of 67, therefore I must be a social media consultant. I must be worthy of your time and attention.” That, I think, is a little dangerous. Mark: It is dangerous. It really is dangerous. I think a lot of people draw similarities between a Klout score and a credit score. A credit score is not even an indication of your integrity, it’s not an indication of your ability or your willingness to pay off a bill, but it’s an indication of something. As long as you know that it’s very limited and what it’s an indication of, you’re going to be okay. If you start using credit scores to make assumptions about people beyond this narrow little sliver of what it’s suppose to represent, it’s wrong. I talk about this in the book. I’m concerned about some of the human aspects of what could happen as these scores go mainstream, and that’s one of them. It’s going to create almost like a caste system of haves and have-nots. Jay: I’ve not experienced it personally, but I’ve heard tales of people putting their Klout score prominently on their resume, and people being hired and not hired for social media positions based on, at least to some degree, Klout score and things like that. I think that’s a little bit of a misuse and misapplication of the data. But there are good examples of companies using Klout for promotional purposes or influence or outreach. What are some of the examples or cases studies that you think are interesting? Mark: I think I’ve got at least 15 case studies in the book. To be honest with you, I think it’s the highlight of the book because these are case studies that have never been seen before and it lifts the veil of this mystery of what the brands actually do with these things. What I love about that chapter is the creativity. You look at the one example from Burson-Marsteller, a large PR firm based in New York but they’re global, I think there are 80 offices or something like that, how they’re using Klout scores in crisis management. If something breaks, bad news for one of their customers, they’re actually looking at what the Klout scores re of the people who are trying to share this information and they’re making decisions. They can predict if this thing is going to move or if it’s not going to move based on the Klout score. I actually think that’s a good use of the scores, because I think Klout scores are an indicator of how well people can move content through a network and beyond a network. I think that is what is the small sliver of what’s being measured here and increasingly well. Jay: One of the things that I think you mentioned in the book, and I’ve heard people from Klout talk about it in presentations, is that on average somebody who is tapped to participate in a Klout Perks kind of program creates on average 30 pieces of content about whatever business that they interact with. Between Instagram photos and tweets and Facebook status updates and LinkedIn posts and blog posts, etc., it almost doesn’t matter as much the amplification of that person. If you could say, “Look, here’s what we’re going to do. If you pay this company some money, we’re going to find some people, regardless of influence, and each of them are going create on average 30 pieces of content about your brand.” That, in and of itself, has value. That forced amplification opportunity is pretty interesting. Mark: It’s measurable, and you can compare that type of impression in some ways to traditional advertising impressions. Here’s the power that a lot of people aren’t really understanding. This is the power of someone creating these impressions, let’s say, about a new Subway sandwich. While they’re sitting in the store eating the sandwich they’re taking pictures and they’re tweeting and they’re talking about this. These are people who love your product, advocating your product where it’s being used. This is entirely new. Really, it’s a new marketing channel. This couldn’t have happened two or three years ago. You needed to have this widespread adoption, you would have had to have widespread access to high-speed Internet and widespread adoption of these publishing tools for this to even be possible. The layer on top of this is the algorithm, figuring out who’s creating buzz. That is revolutionary. This whole process of creating an influence score like an E-score or a Q-score used to be, this is behind the curtain secret stuff, what’s Tom Hanks’ E- score, what’s George Clooney’s Q-score. Now everybody has an influence score, and brands are tapping in and finding these people. It’s a new marketing channel. Jay: One of the things I think is really interesting, especially for the enterprise, is to measure internal influence, right? Who is influential within the company so that they can have teams coalesce around them, or communicate more effectively with coworkers, or answer more questions in terms of knowledge transfer. I really like that idea. Mark: Thank you. That was one of my ideas. Jay: Of course. Yes, I know. That’s why I brought it up. It was in the book. Mark: Oh, thank you. Flattery will get you everywhere, Jay. It’s a little scary, too, because now you just can’t tell somebody that you’re being successful at an account or that you’re influential at an account. Why couldn’t you apply these same measures in an internal environment? Here’s the thing. Very rapidly, these online conversations are being connected to offline behaviors. Look at the Facebook timeline and what Facebook is trying to do there; document every step of your life. Many people are willing to do that, so increasingly you’re going to be able to say, Jay Baer writes about a new restaurant or a new record album, and people are going to be putting on their timeline, well this person is connected to Jay. He’s influenced by Jay, and every time Jay writes about Radiohead, Mark Schaefer goes out and buys this album. Those dots are being connected. In short order, you’ll be able to do that in many aspects of our life and use it as an internal gauge. There’s no reason that that couldn’t happen and I think it will. Jay: We’ve talked about this in the past and we’ve each written about it. Klout, itself, has some weaknesses. They’re trying to quantify something that’s very difficult to quantify. There are other companies in this space, PeerIndex, Peek Analytics, that are all trying to do opinions, people are trying to do virtually the same thing. It’s a tough nut to crack, but I think we both agree that this concept of influence measuring is here to stay because it’s so valuable to businesses in this sea of information where every customer is a reporter, to be able to say, okay, well if every customer is a reporter and all these people are communicating about and to us, within that field, which of these people have a larger audience? I think that clearly is something that companies are going to gravitate toward and build into their day- to-day operations. Mark: I think that wisdom is being cloaked by emotion. It’s a difficult situation because they’re innovating and iterating in public. You’ve built companies, I’ve built products and I’ve built companies and worked for big companies, and sometimes it’s like making sausage. It is ugly. You make mistakes, but hopefully at the end of the day you’re going to have a beautiful, tasty product. Klout has made some missteps. If it was a typical company, a normal company, we wouldn’t even know about it. But they’re iterating in public and they’ve created a lot of controversy for themselves. Some of their mistakes were based on some of the judgments they made. Some of them it was the situation. Nevertheless, it’s created a lot of emotion that I think has cloaked this fact that they are onto something. Let’s get through the emotion. Yes, there are problems, and yes, there are things that are wrong, but we’ve got to look at the facts. We’ve got to look at the very real business opportunities and look at how businesses are using this and driving action to their bottom line. Jay: Certainly, and something that will help people cut through the emotion and understand the facts is the new book, Return On Influence: The Revolutionary Power of Klout, Social Scoring, and Influence Marketing .